High quality business cards are printed on both sides in full color with a protective UV overcoat. Business Cards tell your clients who you are and what you do. Let your business card stand outt. Unlimited design options. Your card doesn't have to be selected from a small list of backgrounds or artwork. PM Photo will custom design your card so that it is unique - just like you. 2-sided - 4-color printing on 14pt card stock with a UV overcoat. A new business, a Thank You, a reminder for services, or advertising. 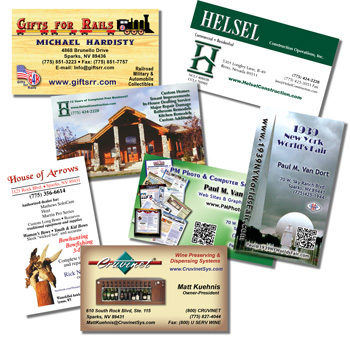 Whatever the message is that you are sending, Full-color Post Cards deliver. Printed on high quality 14 point card stock, these post cards are an inexpensive way to reach your current or potential customers. Brilliant colors and graphics are eye catching and help keep you in the mind of your clients. Photos, graphics and text come together to form one image... your image. 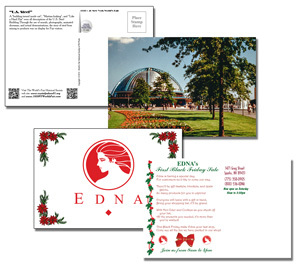 The reverse side of the post card can be printed with your special advertising message, full 4-color graphics, or left blank for a personal note. Contact PM Photo for pricing.